The dining room was quiet except for the staccato duet of fork on plate. My friend T. held up his well-scraped plate and broke the silence: "This is what 'I want more' looks like." That evening's plate-scraping was due to this simple-but-soulful apple cake; the recipe borrowed and improvised from my prized copy of Thomas Keller's The French Laundry Cookbook. The recipe originates from Sally Schmitt, who owned and ran the kitchen at The French Laundry restaurant before chef Thomas Keller bought it in 1994 and brought it to its current re-known. The recipe pays homage to their relationship, which still continues to this day: Chef Keller gets his apples for The French Laundry from The Philo Apple Farm, where Sally and her husband, Don, have retired. The cake comes together in a buttery batter of flour, sugar, butter, milk, baking powder, vanilla and a rasp or two of freshly grated nutmeg. The batter is quite thick, so it will need a gentle coaxing with a spatula to the sides of a well-floured pan. For the top of the cake, crisp apples are peeled and sliced (I used some local Braeburns). The apple slices are artfully arranged, edges down, into the bed of batter - like the spokes of a wheel. 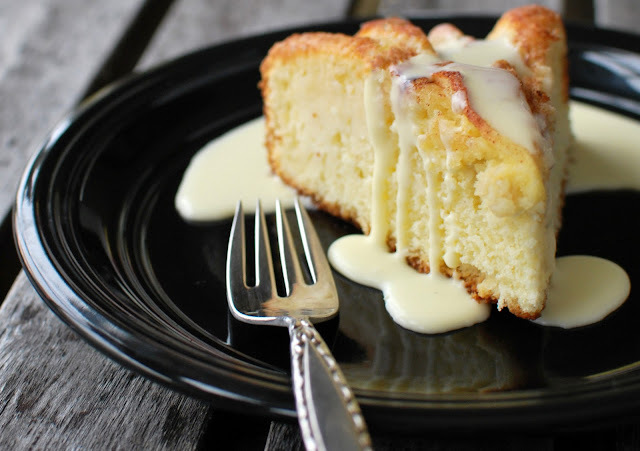 Cinnamon-infused sugar is generously dusted across the top of the cake and baked until golden brown. The sweet crystals cling to the surface and perfume the apples with cinnamon as they soften, caramelizing the slivers of dough in between. Sally Schmitt's original recipe calls for cranberries as well, but I prefer letting the apples speak for themselves. Each apple-laden slice chats amiably about its recent introduction to butter, sugar, vanilla, nutmeg and cinnamon, encouraging you to taste how well they get along in the next slice. For the accompanying sauce, heavy cream, sugar, butter, and vanilla are brought together over medium heat to thicken and seduce. The sauce is the liquid equivalent of lingerie - perfectly designed to cover 'just so', and a particularly delicious way of accentuating the goods underneath. The cream sauce hunts for hollows in the cake and pools on the plate. Forkfuls of buttery apple cake skate across the plate to soak up as much of the sauce as they can hold until fork meets empty plate again in that symphonic 'call for more'. Enjoy! In a stand mixer, cream butter, sugar, and egg until mixture is fluffy and paler in color. In a separate bowl, combine flour, baking powder, salt and nutmeg. Add to butter/sugar mixture, alternating with the milk, until just combined. Spread batter in butter and floured 9" round cake pan. 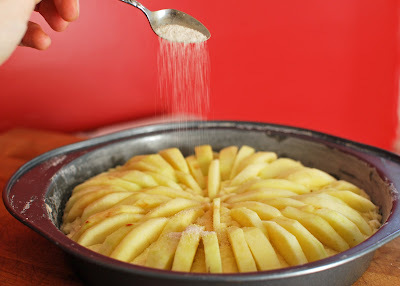 Starting in the centre, place apples into the batter, edges facing down, working around the pan in a circular pattern (like the spokes of a wheel). Sprinkle top of batter with cinnamon-sugar mixture and bake until golden and a toothpick inserted in the centre comes out clean (about 45 minutes). In a saucepan, combine the above ingredients and bring to a boil over medium heat, stirring constantly. Reduce heat and continue to stir until mixture thickens slightly (approximately 10-15 min). 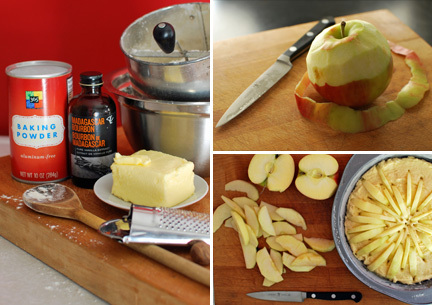 Serve warm over Apple Cake, or allow to cool and thicken further before serving. Once cool, keep refrigerated. Oh, I am so making this cake! I've had my eye on this one for a looooong time...! To say that I am 'in love' with Thomas Keller is an understatement. LOL! Since eating at Per Se, his food has been my benchmark for everything!!! 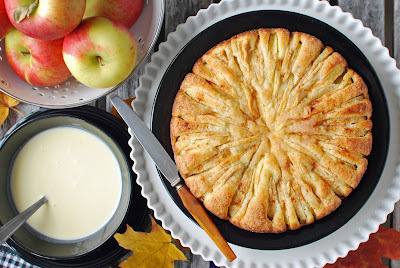 I'm sure this apple cake is super delicious! What a benchmark - so envious you've eaten at Per Se! Did you keep a menu? Would love to know what you ate! I've had my eye/heart/appetite set on dining at French Laundry since I first read about it, ages and ages ago. Some day...In the meantime - this cake. I've made it four times already! Wow! 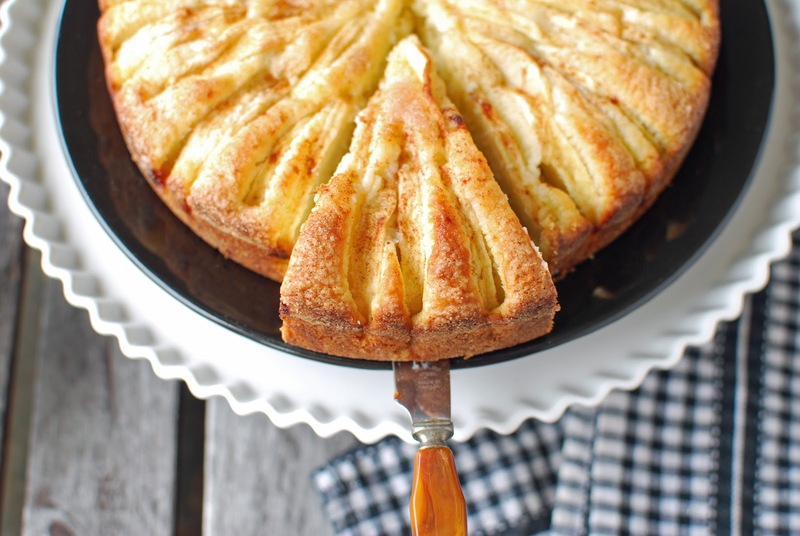 This apple cake looks absolutely delicious! we simply adore apple and vanilla as a flavour combination!! What a beautiful blog you have here! As fellow foodies, we can't wait to read more of your lovely posts :) New follower here! Thanks for stopping by, ladies - and for following. :) Wishing you both a lovely weekend as well! This looks luscious, you describe it so beautifully, and I'm pretty sure I can find lots and lots of other uses for that sauce! Thank you, Sue. I like how on your blog you say you 'pursue every craving to its logical conclusion' - which is what I did with this cake: logically concluded that more sauce was a very, very good thing. OMG, this apple cake looks fabulous! Happy I found your lovely little blog today. So glad you stopped by, Ashley. Visited your blog and can I just say I am jealous that the delicious things on it are both made (and eaten!) in my favourite city :) Glad we share the same views on butter and bacon. I also consistently 'suffer' from culinary dyslexia. Braeburn/Bourbon...makes sense to me :)Happy Holidays to you as well, Wendy! This looks amazing, I love that it's called a laundry cake. The cream sauce is almost near to perfection, I love the consistency! I'm just not sure why on earth didn't I know about The French Laundry Cookbook. My kitchen should have sniffed some of these heavenly cakes! I made this cake twice in a row trying to keep the fruit showing.